A judge has ruled that the remains of a Colonial-era resident who may have been a surviving member of Blackbeard's pirate crew must be turned over to people thought to be the man's descendants. Judge Wayland Sermons Jr. approved an agreement Wednesday between state officials and the presumed descendants of Edward Salter, who died in 1735, The Washington Daily News reported Thursday. The state Office of State Archaeology now possesses the bones uncovered in 1986 during construction of a bulkhead near the Colonial port town of Bath by a phosphate mining company. The state is to turn over the remains June 18. Sermons also praised the work of researcher and historian Kevin Duffus of Raleigh for his research into the remains. Duffus' 2008 book, "The Last Days of Black Beard the Pirate," argued that Salter was a barrel-maker who was forced to join Blackbeard's crew and was not executed in Williamsburg, Va., along with other crew members after the captain's death in 1718. "You, sir, have opened a can of bones and I thank you for it," Sermons told Duffus. Duffus has sought genetic testing on the bones to confirm his theory. DNA identification may be possible in the future, but for now other tests can narrow down whether the bones match up with what is known about Salter, said Smithsonian Institution anthropologist Douglas Owsley, who plans to examine the remains beginning later this month at the request of Salter's presumed descendants. OCRACOKE ISLAND - The steady, slow drumbeat accompanied the marchers as they paraded down Lighthouse Road. Sometimes they sang in unison, and sometimes they marched in silence, with only the sounds of their leather boots striking pavement to accompany the drum. Although photographers swarmed around them, and spectators openly gawked, the marchers never broke ranks or even broke into a smile. It was a solemn occasion, a funeral march, and they kept to their paces, seemingly oblivious to the spectacle they were making. Pirates had returned to Ocracoke to honor their dead. In accordance with an order by Beaufort County Superior Court, the skeletal remains of Edward Salter were returned to his descendants on June 18, 2010. 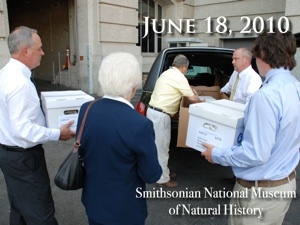 Before the remains will be reinterred at Bath, N.C., the descendants and Kevin Duffus took the bones to the Smithsonian’s National Museum of Natural History for a final forensic examination. 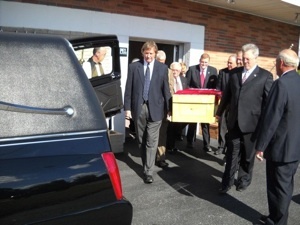 Paul Funeral Home of Washington, N.C., generously provided the use of a coach to respectfully transport the remains. OCRACOKE ISLAND - It used to be that the ocean regularly coughed up pieces of wrecked ships onto the beaches of the Outer Banks, remnants of lost struggles with savage storms and unseen enemies. Oftentimes, islanders salvaged the debris that washed ashore, crafting houses and furniture out of the sturdy timbers. Many times, they buried bodies of strangers on nearby hummocks or ridges, their graves unmarked, their stories forever untold. Hundreds more were taken to eternity, silently, by a terrible sea. 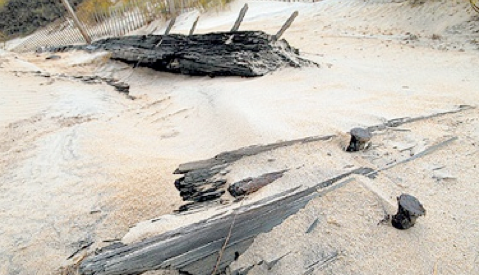 "The Outer Banks of North Carolina is known, first and foremost, as the graveyard of the Atlantic," said Kevin Duffus, author of "Shipwrecks of the Outer Banks, An Illustrated Guide." "Literally, from Virginia Beach to Cape Lookout, I consider the Outer Banks a vast seafaring cemetery." It was Outer Banks historian David Stick's 1952 book, "Graveyard of the Atlantic, Shipwrecks of the North Carolina Coast," that stamped the barrier islands with that romantically tragic moniker. Duffus' book is considered the first to tackle the subject for the general readership in the 54 years since. "When he first mentioned he was doing this book, I thought, 'My God, here we go,' " Stick said. But his skepticism didn't last long. "What he does is simply supplement what I did." Stick, 86, said that Duffus has interviewed him numerous times for different projects and he has become a trusted friend. "I'm very pleased and very proud that he did it," he said in a telephone interview from his Kitty Hawk home. "What he was able to do was add a tremendous amount of material that was not available to me at the time." Captivated as a teenager by Stick's book, Duffus in 1997 finally produced his first independent film about the topic. That effort launched a career focused on Outer Banks maritime history. I n the back of his mind, he still held onto a belief that there was more to tell about shipwrecks on the Outer Banks. "That's the one thing that people think of when they visit the Outer Banks," Duffus said. WASHINGTON, N.C. -- Lawyers for the state acknowledged in a special session of Beaufort County Superior Court on Tuesday that the state archeologist did not follow proper procedure in 1986 when the archeologist unearthed the remains of a man believed to be a member of Blackbeard’s pirate crew. Karen A. Blum, an assistant attorney general, told Superior Court Judge Wayland Sermons that the state had not published notice of the excavation of the remains, as required by state law to determine the identity or next of kin — or both — of the deceased. State Archeologist Stephen R. Claggett said, under questioning by Sermons, that the state’s oversight should not affect the court’s decision regarding the estate of Edward Salter. “There was a tremendous amount of statewide publicity about what we were doing,” he said. Sermons said he will file a written decision in the case. He asked the public not to contact him about the case before he rules in the matter. The hearing — an appeal of a May 2009 ruling by Clerk of Court Marty Paramore — to determine whether Salter’s estate should be reopened was heard before a crowd of some 40 onlookers. It was scheduled after J. Erik Groves, a lawyer for Kevin P. Duffus, appealed Paramore’s ruling denying the request to reopen Salter’s estate and appoint Duffus, a Raleigh researcher and author, its executor. Blackbeard’s Crew, a piratical living history troupe based in Hampton, Va., teamed up with Blackbeard historian Kevin Duffus of Raleigh to organize a “Pirate Memorial,” an event that they hope will be the first of many. 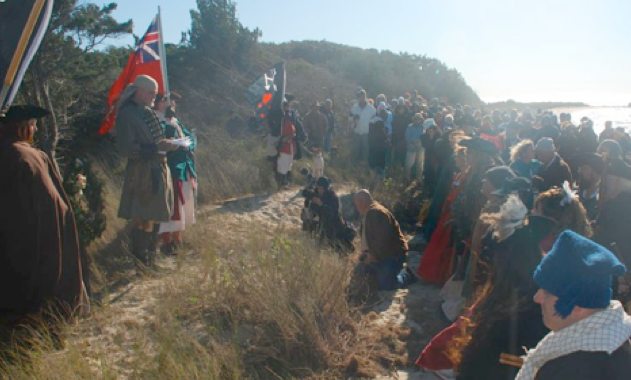 Fifty-eight men and women in period costumes joined together on Nov. 22 to commemorate the 290th anniversary of the Battle of Ocracoke – that infamous day when Blackbeard the pirate met his match in Lt. Robert Maynard of the Royal Navy. The new nonprofit organization has plans to return Blackbeard’s legacy, and some of the money associated with it, to Beaufort County by building a full-scale replica of Blackbeard’s ship, the Adventure. The Adventure is the ship Blackbeard was aboard when he was attacked and killed at Ocracoke Inlet by British forces sent to deal with the pirate by the governor of Virginia. The nonprofit has plans for the replica to serve as an interactive museum — and a way to attract tourists to Washington. Alliance members said the vessel will be historically accurate. “It’s fully authentic all the way through — except for the engine and to meet Coast Guard regulations,” said Pat Mansfield, one of the group’s organizers. Kevin Duffus rejoins the program - he's the author of several books, including "Shipwrecks of the Outer Banks," "The Lost Light: The Mystery of the Misssing Cape Hatteras Fresnel Lens" and now his latest, "The Last Days of Black Beard the Pirate." We'll talk about some myths and strongly held beliefs that many have about the famous pirate and which ones turn out not to be fact. Duffus has done painstaking research over a period of several years and has uncovered some interesting truths about the man best known as Black Beard the Pirate. We'll talk about them and his North Carolina roots on the next Charlotte Talks with Mike Collins. The subtitle to Raleigh author Kevin Duffus’ latest book is, “Within every legend lies a grain of truth.” Duffus has been on a 35-year mission to uncover the grains of truth within the legend of North Carolina’s best-known seafarer. But mostly what he has found is historical inaccuracy. Among other things, he questions widely accepted beliefs about Blackbeard’s origins and the fate of his crew on the day of his death. Duffus joins guest host Eric Hodge to debunk some of the popular myths about the scandalous pirate. HAMPTON, VA -- It's true that Blackbeard fought his final bloody battle at Ocracoke Inlet, and his head was taken triumphantly to Hampton. But much else of what has been recounted about the life and death of the infamous pirate and his crew may be little more than a product of masterful marketing and political cover- ups. BATH - In a pirate-worthy broadside on conventional history, a Raleigh author claims that Blackbeard and many of his henchmen weren't rogue Englishmen, but sons of North Carolina landowners. Most historical accounts contend that the notorious pirate known as Edward Teach or Thatch was from Bristol, England. But Kevin P. Duffus said his review of archives and genealogical research indicates that Blackbeard was probably Edward Beard, son of a landowner in Bath in Beaufort County. "There's never going to be a smoking gun to determine who he really was," Duffus said of the pirate. "My version is a lot more plausible than what's been foisted upon us for nearly three centuries." The writer also claims that several of Blackbeard's crew members were not hanged as earlier accounts said and at least three returned to North Carolina to respectable -- and wealthy -- lives. With the help of genealogists, Duffus has found a descendant of one of Blackbeard's known crew members, Edward Salter. Under prodding by Duffus, state officials are investigating whether a skeleton kept for years in a state archaeology lab in Raleigh is that of Salter, who lived out his life near Bath. The bones were recovered in 1986 from a crypt near the Pamlico River. If DNA tests show that the bones are Salter's, the identification would establish that at least one of Blackbeard's men had family roots in Bath. Steve Claggett, the state archaeologist, said such a scenario could be true. "I think there's a pretty good case for it," he said. The state already claims the wreckage of Blackbeard's flagship, the Queen Anne's Revenge. Hundreds of artifacts, including cannons, ship rigging and even traces of gold dust, have been recovered since 1996 from Beaufort Inlet, where historians say the pirate ran the ship aground. Duffus is bracing for a backlash from historians and Blackbeard buffs. He admits he doesn't have conclusive proof of his assertions, but he thinks they are more plausible than versions that have been around for generations. "Blackbeard followers revel in retelling their favorite Blackbeard fable over the years," he said. "I realize they will not let go of them easily." The pirate is largely known for his exploits late in his life, before troops from Virginia tracked him down and killed him at Ocracoke in 1718. His ties to Bath have been documented, and some have become the stuff of legend, but there is scant evidence of his early life. Duffus' theory is that Blackbeard was the son of Capt. James Beard of the Goose Creek area near Charleston, S.C., who owned about 400 acres on the west bank of Bath Creek as early as 1707. He says Beard's son Edward, born in South Carolina in 1690, came to Eastern North Carolina with his father but was also taken to Philadelphia, where he learned his sailing skills. Duffus suggests that Edward Beard sported a black beard and used "Black" as a nickname, much like fellow pirate Black Sam Bellamy. By his account, Thatch or Teach was an alias, and the pirate's moniker was actually Black Beard, later condensed to Blackbeard. Most accounts of Blackbeard's early years stem from references by Capt. Charles Johnson in "A General History of the Robberies and Murders of the Most Notorious Pyrates [sic]," an 18th-century best-seller. "Edward Teach was a Bristol man born," he wrote. Ocracoke Island - It is about an hour before sunset on a spectacular Ocracoke evening. It is the night of the new moon — the last day of summer. There are seven of us heading down the path through the North Carolina Land Trust’s property to Springer’s Point. We walk through the canopy of live oaks and native shrubs over a high hammock and head to the shore of Ocracoke Inlet. Then we make our way through tall marsh grasses toward a small, sandy beach that faces Teach’s Hole in the inlet. But Duffus says there is no documentation of a Teach or Thatch in Bristol, and no one knows for sure who Johnson was or where he obtained his information. "They [skeptics] can accept seven words written by an author whose true identity remains a mystery," he said -- "or a preponderance of circumstantial evidence." David Moore, curator of nautical archaeology at the N.C. Maritime Museum in Beaufort, agreed that the link to Bristol is tenuous. But he also said the link to Bath is speculative. "I find it extremely hard to believe if there was an association we wouldn't know it now," he said. Moore, who has researched Blackbeard's career, said new claims will spur more interest in the legends -- not that pirate lore has been lacking. "Pirates and piracy have held a fascination with the general public since piracy began," he said. Another pirate researcher, Charles Ewen of East Carolina University, said Duffus' theories about Blackbeard and Edward Salter are plausible, but he maintains his skepticism. He said it may be difficult to ever find a definitive answer. "The onus is on the naysayers," he said. In his self-published book, "The Last Days of Blackbeard the Pirate," Duffus recounts his search for answers to the mysteries surrounding Blackbeard's link to Eastern North Carolina. He says he found documents that earlier researchers either overlooked or ignored. For instance, he cites a document in British archives that says two vessels that cornered Blackbeard at Ocracoke approached from Pamlico Sound. Earlier accounts indicated they came from the ocean. That is a significant difference, he said, because it explains why Blackbeard was surprised in waters he knew well. "If history could make this error, what other errors could have been made in telling the Blackbeard story?" he asked. Traditional accounts also said that 15 men suspected of being part of Blackbeard's crew were tried in Williamsburg, Va., in 1719. Thirteen were reportedly convicted and hanged, one was pardoned for his testimony, and the other was not a crew member and was acquitted. According to Duffus, nine were either pardoned or acquitted, and only six were executed. Three with ties to Bath, including Edward Salter, were not hanged, he said, adding that Salter became a merchant and gentleman who owned substantial property. Some of Duffus' findings are not new. He credits genealogy research on Beard and Salter by Allen Hart Norris, John H. Oden III and Jane Stubbs Bailey that was published in a journal in 2002. But he has also traced Salter's line to a possible living descendant. State officials are reviewing Duffus' request for DNA testing on the skeletal remains in Raleigh. Claggett, the state archaeologist, said the studies could cost up to $6,000. He said other researchers are considering facial reconstructions that would show what the man looked like. Duffus is challenging other myths and legends about Blackbeard, including the fanciful tale that Blackbeard's headless body continued to swim after being tossed overboard. He says Blackbeard's body is probably buried at Ocracoke along with those of the slain pirates and Royal Navy sailors. The burial ceremony was conducted with all the usual solemnity due an occasion that marks the passing of a loved one. The key difference was this loved one didn’t die a few days ago — he passed away in January 1735. Remains believed to be those of colonial-era cooper, merchant, assemblyman — and, perhaps, Blackbeard the pirate’s crewman — Edward Salter were reinterred Sunday afternoon in Beaufort County. Gathered before the reburial at Washington’s Paul Funeral Home, with a dozen or so known Salter heirs and others, Father Eric Zubler of Bath’s St. Thomas Episcopal Church said a prayer. “May angels surround him and saints welcome him in peace,” Zubler said of Salter. Shortly after the prayer, the remains were transported by hearse to the burial site. At the graveside, Zubler and the heirs tossed handfuls of dirt on top of the coffin, which was made of Beaufort County pine and donated by Impressions Marketing Group of Washington. 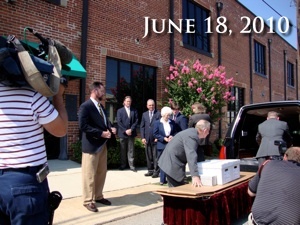 The funeral was donated by Paul Funeral Home. As the heirs sat under a funeral tent at the graveside, Zubler approached them to say that, in looking at them, he saw family members who might not have come together but for the rediscovery of Salter’s remains. 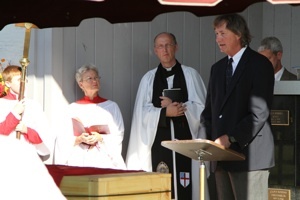 Bible verses were read by Tom Thompson, Beaufort County’s chief economic developer, and one of the heirs, the Rev. John Stephen Park of Fort Wayne, Ind. 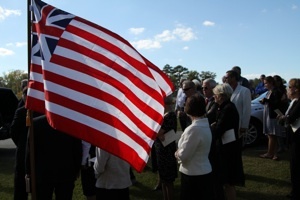 Kevin Duffus, a Raleigh researcher and historian who speaks for the heirs, gave a eulogy, the coffin before him draped in a British flag of the colonies. The remains were disinterred from a brick-lined tomb roughly a quarter-century ago as part of archaeological investigation into the Beasley Point area in Bath. The investigation was initiated after Texasgulf Chemical Co. hatched plans to build a bulkhead on the property. Begun in 1985, the investigation was ended in 1986, according to county officials. Salter’s remains were tucked away in a state storage facility for years, until a group of heirs and history buffs successfully petitioned the court to have the bones returned to Beaufort County. Now that the bones have gone back to ground, at least for a while, the heirs and county officials are urging PotashCorp, Texasgulf’s successor corporation, to allow Salter to be permanently reinterred on the Beasley Point land, which the company owns. Toward that end, one of the descendants will meet with PotashCorp officials Thursday, Duffus related after Sunday’s ceremony. Before the ceremony, several of Salter’s heirs were overheard expressing their collective wish that the remains be reburied at Beasley Point, exactly where they were unearthed, and that the family and the public be permitted to visit the grave. In his eulogy, Duffus referred to the Pamlico River, which has sustained life here for centuries, and to Salter, whose life’s journey ended on Bath Creek. Surely, these words, or similar expressions of relief, gratitude and amazement, were spoken for the better part of nine decades, as legions of mariners navigated around the deadly dangers of Diamond Shoals. For more than 25,000 nights, this light flashed from a lighthouse at Cape Hatteras, delivering its signal of assurance, caring, and guidance through the green-tinted crown-glass of its French Fresnel lens. Throughout countless storms, impenetrable fogs, and even an earthquake, the counterweights fell, the gears and rollers turned, and the 12-foot-tall apparatus of 1,008 prisms and bullseye lenses gracefully rotated around its 4-wick hydraulic lamp. And night after night, the light flashed faithfully, once every 10 seconds. Today we know that one of the most historic and perhaps the most abused Fresnel lens in America graced the lantern rooms of two lighthouses at Cape Hatteras—the octagonal stone and brick tower of 1854, and later, the “modern” barber-pole, black-and-white striped 1870 tower. The long-lost history of this intrepid lens manufactured by the Henry-Lepaute Company of Paris has been found. Remnants of the vandalized lens have been rescued. And, along with its substantial cast-iron pedestal and clockwork mechanism, what has survived of the Victorian-era lighthouse artifact is now exhibited at the Graveyard of the Atlantic Museum in Hatteras village for the world to see. For more, click here. ©2010 Looking Glass Productions, Inc. USA, All Rights Reserved.